Critical Thinking Can Be Destructive! (2.i) Eliminate This Success Block Now! Success starts in the mind but it can easily be blocked by your critical thinking! Everything in life is cause and effect. Thoughts are the cause and your emotions (whether negative or positive) are the effect. It is very important to understand this concept! If you have ever wished for an instruction manual on “how to change your life” or a road map to show you “how to get from where you are now to where you want to be” I am providing it to you here for free. Your life is a mirror image of your thoughts. Changing your thoughts, methodically eliminating your critical thinking, and switching any negative thoughts to a positive power mindset, ultimately changes your life and creates the new reality you focus on. If you believe in the power of positive thinking, chances are good you already experience joy, happiness and success in your life. On the other hand, if you do not understand the pitfalls of allowing critical thinking to dominate your consciousness, chances are also good you experience negative emotions such as anger, fear, worry, anxiety or depression. cri-ti-cal (krit-ih-k’l)adj.1. Relating to criticism. 2. Faultfinding; carping; fastidious. 3. Crucial; decisive. 4. Dangerous; hazardous. Have you ever considered critical thinking to be hazardous or dangerous? It is! Whether you are critical of others, or even worse critical of yourself, it is a dangerous habit of which most of us have been guilty. One of the keys to success is realizing you are not your thoughts. You have the ability to focus on any thoughts that come to your conscious awareness. You alone control what enters your head as a thought. If you don’t control your thoughts, who will? Through awareness, you will discover more than 80% of your thoughts are automatic. They are the same fear and worry thoughts (negatives) repeated endlessly throughout your day. Effectively, you are re-creating the past over and over in your mind every day, focusing on what you don’t want in life. This is all happening on auto pilot! The more your critical thinking is focused on the past, the more you attract the same past into your current reality. This is why many of us experience recurring problems with things like relationships, employment or money. On the Home Page, I placed the quote from Einstein “It is a sign of insanity when we repeat the same things over and over and expect different results.” Yet, we have all been repeating the same thoughts from the past, while simultaneously expecting our lives to improve and change. It won’t happen unless we change the quality of our thoughts! We have been led to believe we cannot control our subconscious and that whatever happens we are not responsible. It is easy to believe that any negativity is beyond your control. In the book “Change Your Brain, Change Your Life” Dr. Daniel Amen writes that thoughts have actual physical properties. Every thought you have sends electrical and chemical signals throughout your brain. They have significant influence on every cell in your body! Your thoughts directly influence your subconscious. Initiate a thought of your own choosing. Respond with a thought to an external stimulus. You can control both of these! Here’s the problem with my logic: Controlling your thoughts to create a reality you consciously choose is simple – but – it is not easy. You will not be able to snap your fingers and instantly have conscious control of your critical thinking. This is where most people would rather allow their “amygdala” to stop them from changing and keep them "safe" exactly where they are. Personal growth is a process in which you first become aware of your automatic thoughts, learn to change them to positive power thoughts and have personal reminders placed everywhere to keep you on track. The more you do this, the easier it gets. The easier it gets, the more you do it. Eventually, instead of your subconscious operating on auto pilot and filling your consciousness with critical thinking, you habitually re-direct your thoughts to attract all that is good. Your thoughts create your emotions, affect your health and influence how you respond to everything in life. Positive power thinking is empowering and lifts your spirits, stimulates creativity, energy and activity. Using positive thinking, you feel love and happiness. Critical thinking is using negative, fear based thoughts that block your energy and stop you from taking action. Your mind is then closed to new beliefs, change, growth, solutions to problems and the possibility of living the life of your dreams. Fear based thoughts create worry, stress, anxiety, depression and ill-health - in other words, all of the emotional garbage. Your thoughts are a direct reflection of your beliefs. I know from my own personal experiences, it is very difficult to realize and accept we are responsible for our own emotions. Frankly, if someone would have explained during my years of depression and sadness how my own critical thinking was creating a negative reality, I would have probably told them they were full of you know what. Now I can look back and see exactly how the fear based thoughts were dominating and directing my subconscious to keep me feeling depressed. This law basically states we create or alter our future as a result of our thoughts, actions, spoken words, visualizations, emotions, feelings, beliefs, attitudes, expectations and what we will (or won’t) allow ourselves to experience in life. Whatever you are experiencing in life has been created by your thoughts! Even if you understand the power of positive thinking, realize no one can ever employ “positive thinking” 100% of the time – it is impossible. Accept the obvious fact that life will never be perfect. However, you can learn perfectly how to accept and deal with the ups and downs that life offers with a minimal amount of emotional turmoil. How can you learn to control your thoughts? Learn to intercept your critical thinking. 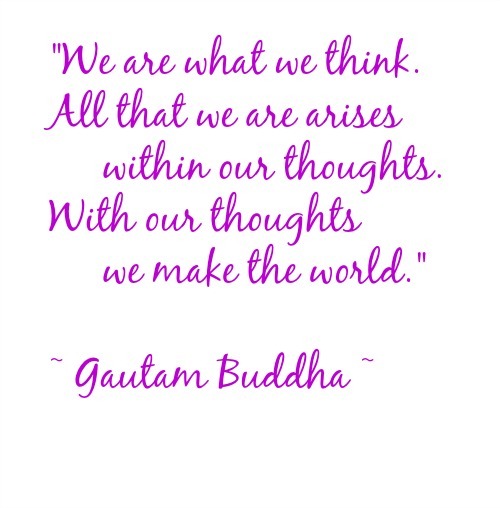 Become aware of your thoughts. This is called cognitive therapy and research has proven it truly does change the brain. In simple words, learn to catch your critical thinking, never complete the thought and change the direction of your mind with a positive thought or picture. When you change how you think and the quality of what you think, you will automatically change the quality of your achievements. You can only change your life by taking full responsibility for how you think about yourself, other people, your relationships, goals and achievements. Other people don’t make you unhappy. You make yourself unhappy with your thoughts. Do you believe you choose to be unhappy? If every time you do something in particular, you become unhappy, doesn’t it then make sense to just stop doing it? Your critical thinking is on auto pilot. It is creating your unhappiness. It therefore makes sense to take this critical thinking off auto pilot, become consciously aware and change your thoughts. The first is an easy to read but extremely profound book on Toltec philosophy written by Don Miguel Ruiz called The Four Agreements. This book will definitely open your mind and change how you think. I can only hope you take from this section a solid understanding that everything (whether good or bad) starts in your mind. Changing your thoughts = Changing your mind = Changing your reality. When you are ready, go to More Than Words where you will learn how the subconscious mind interprets what you say. It's probably not what you want the subconscious to hear!